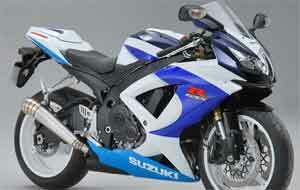 To meet the trilogy motor sport (GSX-R600, GSX-R750, and GSX-R1000 ) limited edition of Suzuki 25 Anniversary, after released GSX-R750, Suzuki informed already released Suzuki GSX-R600 Limited Edition in UK. The motor sport that produced only 25 units, there is no radical changes on the design except Yoshimura exhaust, special made paint combination and serial number & certificate of special production. And the order could be made starting from 1st april 2010 at .imgsx-r.com with cost is higher 122 million than GSX-R600 standard. by ryan. Awesome Inc. theme. Powered by Blogger.